Ladies small 10k yellow gold Celtic cross pendant with Celtic knot and trinity knot detail. Handmade and hallmarked in Dublin. Beautiful ladies small yellow gold Celtic cross with rich Celtic knot decoration. Available in 10k yellow gold and measuring 20mm high (not inc. bale) and 13mm wide. Fitted with an 18 inch yellow gold chain. Handcrafted in Dublin and hallmarked at the Irish Assay Office in Dublin Castle. 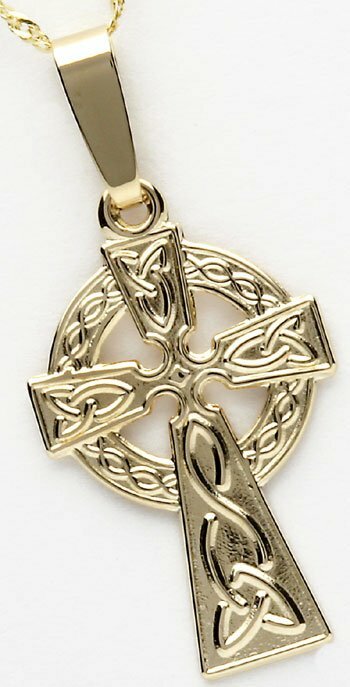 We are proud to be the first Celtic cross jewelry store online. For over twenty years, we have been shipping the finest handmade Irish Celtic cross jewelry from our store in the heart of Georgian Dublin. All our Celtic jewelry is handmade in Ireland and hallmarked at the Irish Assay Office in Dublin Castle.